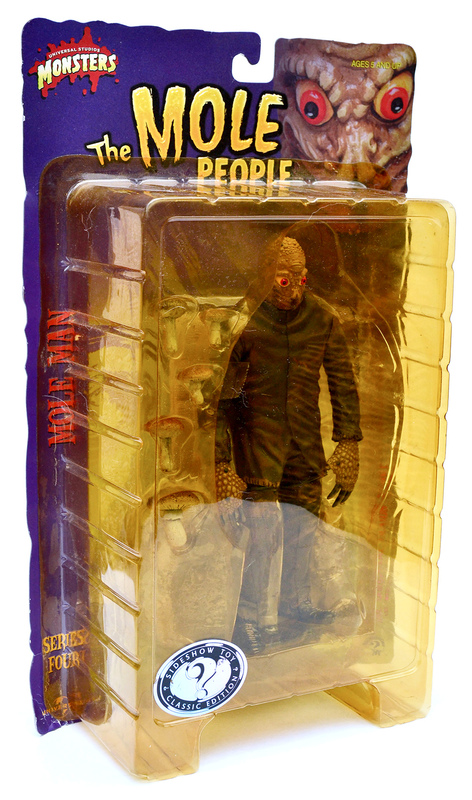 Universal Studios Monsters: The Mole People action figure by Sideshow Toy (2000) | 'TAIN'T THE MEAT… IT'S THE HUMANITY! Released by Universal Studios in 1956 The Mole People was one of the company’s less successful B-movies, and is all but forgotten today. However, it technically did feature a Universal movie monster so in 2000 it received the action figure treatment by Sideshow Toy. The Mole People tells the tale of a group of explorers, lead by two archaeologists played by John Agar and Hugh Beaumont, who discover a race of subterranean humans living deep under ground. This race is ruled by zealous high-priests who use ritual sacrifice to appease their god Ishtar, while also brutalising a race of humanoid mole creatures who they have enslaved. The priests initially believe the archaeologists to be gods, but when one of their party is mortally wounded they quickly turn on the newcomers, who barely manage to escape to the surface with their lives. The Mole People was helmed by veteran TV director Virgil W. Vogel and is, frankly, bloody awful. The story and acting are laughable, the sets are dirt cheap and even with a modest 77 minute run-time the thing just plods along. Today the film is really only remembered as the subject of a Mystery Science Theatre 3000 episode — for anyone who fancies a laugh the entire episode is on YouTube. 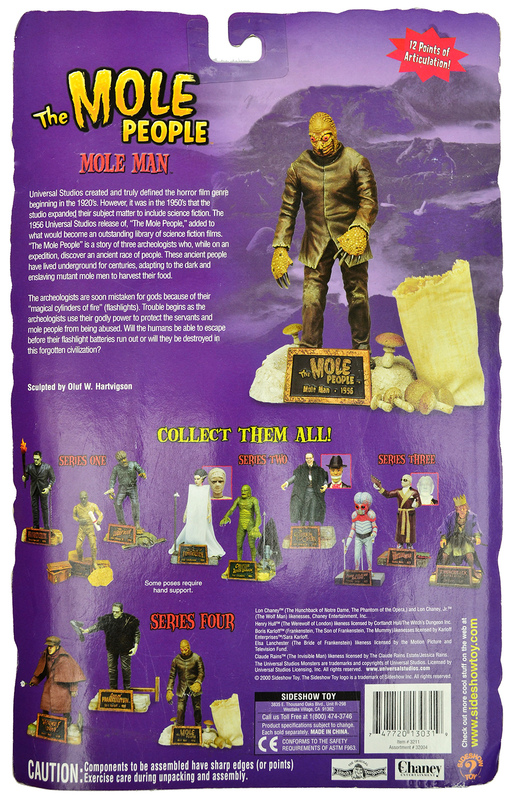 Between 1999 and 2001 Sideshow Toy released Universal Studios Monsters, a collection of 15 posable action figures based on Universal’s iconic movie monsters from the 1930s to 1950s. I can only assume that the inclusion of The Mole People in this collection (it was one of three figures released in Series Four) was due to padding — the collection was released in five groups of three figures and I suspect Sideshow Toy couldn’t find another monster to fill out the ranks. There’s a great deal of detail on the figure’s hands and face. 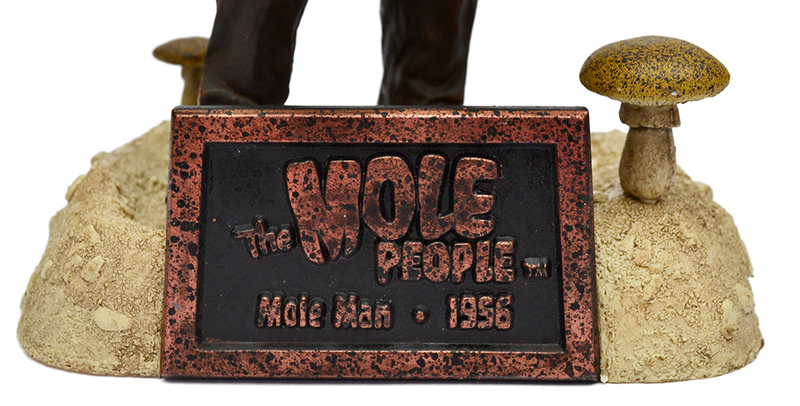 This mole man action figure stood 8½ inches tall when placed on it’s base, and was made from sturdy moulded plastic. The figure boasted 12 points of articulation and shipped in a cardboard-backed blister pack. The back of the packaging featured a short synopsis of the film and showcased other action figures available at that time. The action figure came with two accessories: a selection of mushrooms and a hessian sack. Also included was a base with a nameplate that featured the film’s legend and release date. The action figure also shipped with a base bearing the film’s legend. 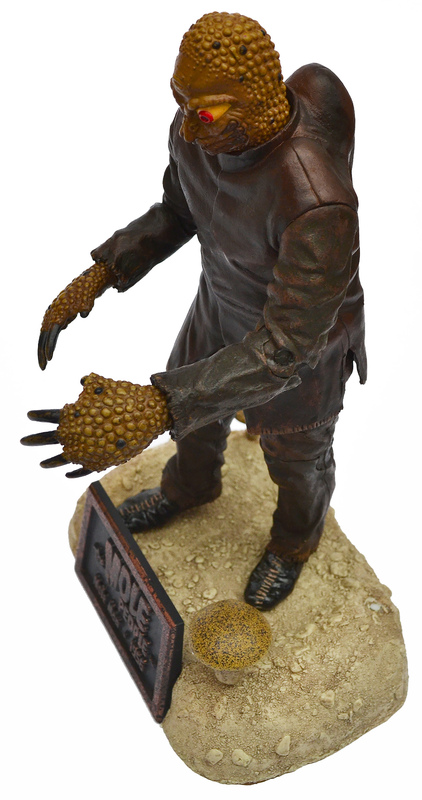 The Mole People action figure was based on a sculpt by artist Oluf W. Hartvigson, who also designed the bulk of the action figures from the Sideshow Toy Universal Monsters collection. Despite the relative obscurity of the character Hartvigson did a good job interpreting the monster; there’s a great deal of detail, especially on the face and hands, and some nice touches (the stitching on the creature’s boots, for example). The paintwork is also of a high quality, especially on the creature’s clothes, which have a nice leather feel to them. The Mole Man, from all sides. 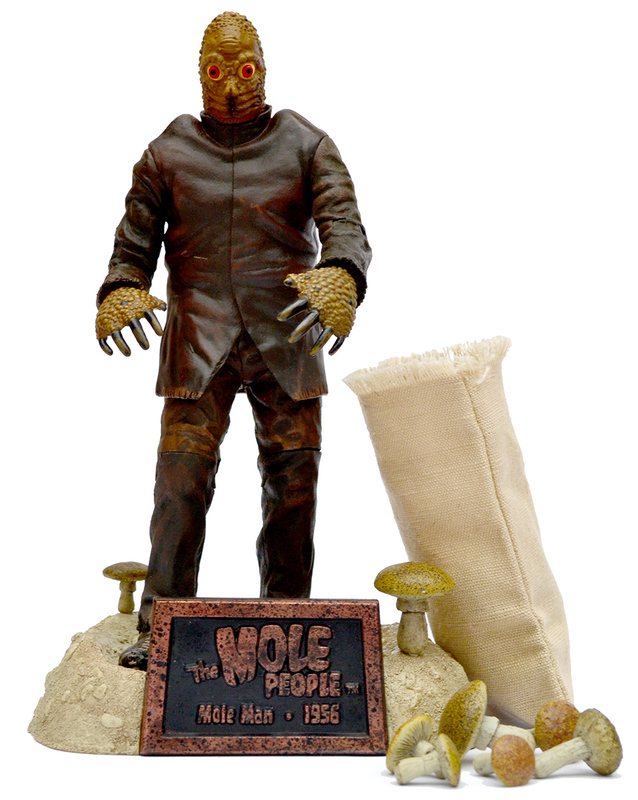 Due to it’s age it’ll come as little surprise that The Mole People action figure is out of stock. Saying that it’s not too difficult to find on ebay with BNIB copies setting you back around £25/$35. 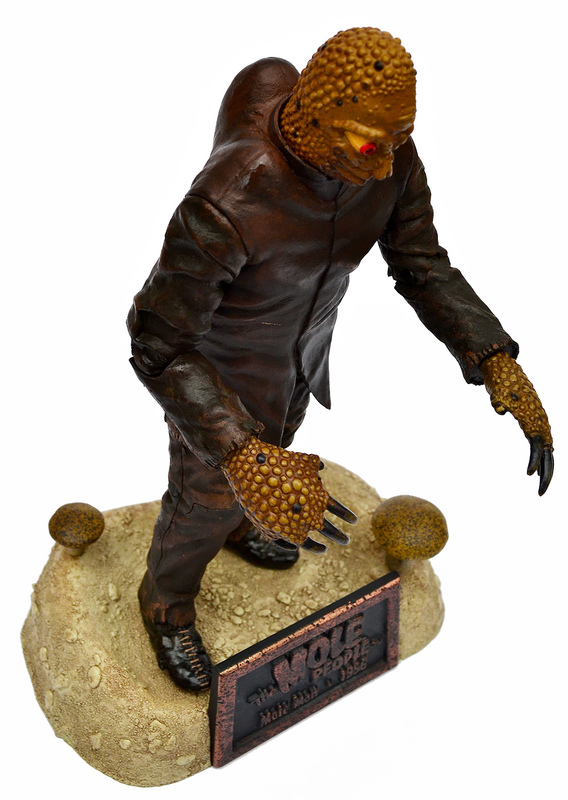 Although it’s well sculptured, and bears a good likeness to the original creatures from the film, this action figure is definitely one just for die-hard fans of the film (whoever they may be), and collection completists (like me). Next: Claude Rains’ memorable performance as The Invisible Man receives the Sideshow Toy treatment.